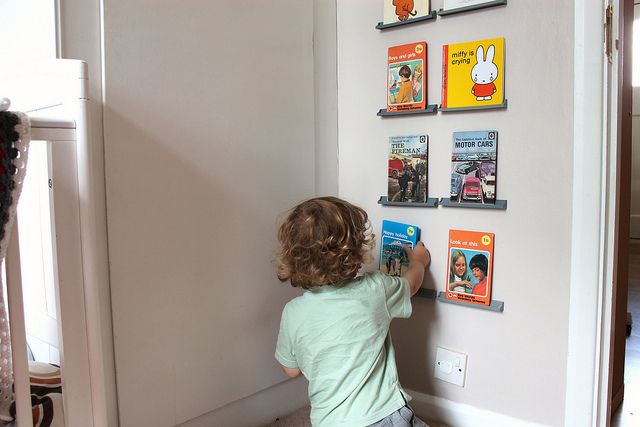 We finally finished off the last bits in Archie's room this weekend, putting up these little scrabble shelves. I found the idea on pinterest with wooden ones, but I thought the grey went kind of well in his room! Its a good use of space behind the airing cupboard door and he likes rearranging them all. 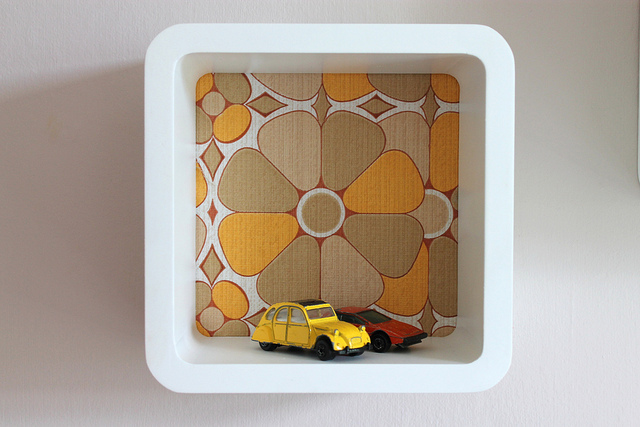 I used the wallpapers I bought from here to line the little cube shelves. 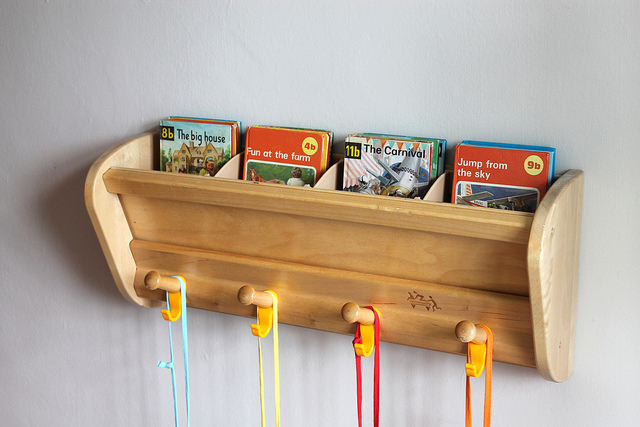 The school hooks were found at a car boot sale, the little pockets in the top are just the right size to keep books in. 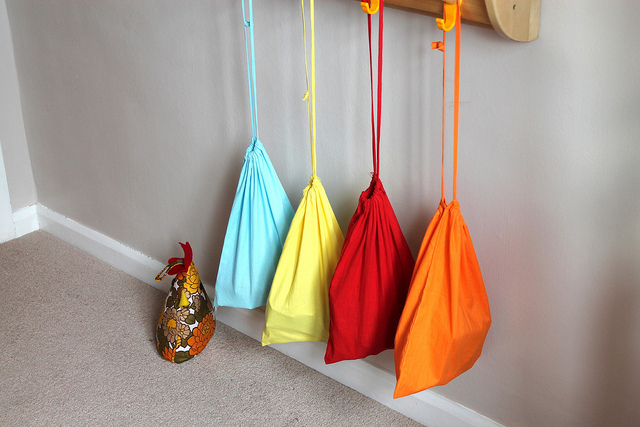 The coloured draw string bags keep a few more toys in and my mum made the hen door stop. 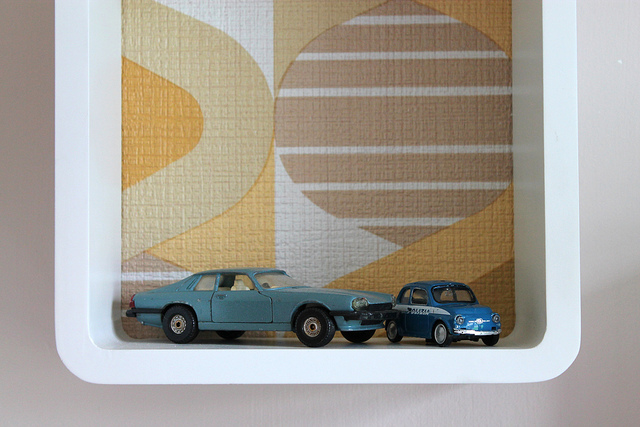 I wanted the room to have a bit of a car theme - he does love his cars! 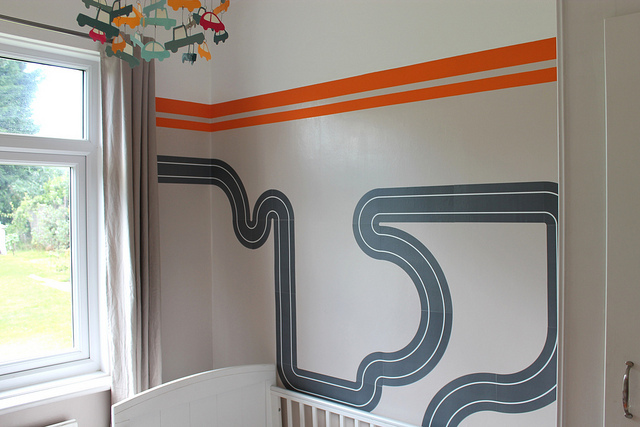 I used some road wall stickers and painted some orange stripes around the top of the room. I thought about having an orange carpet but couldn't find one quite bright enough. 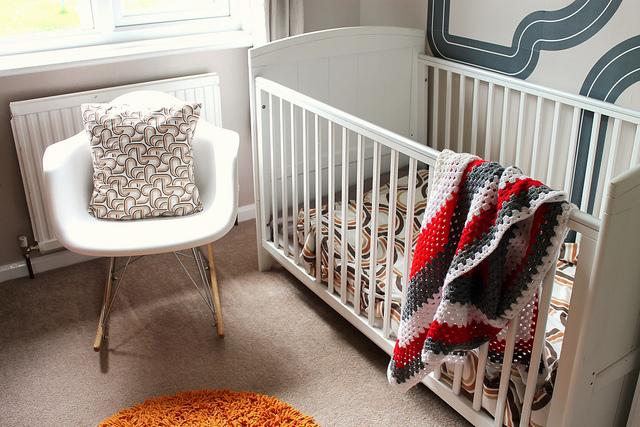 Before we moved Archie was still sharing a room with us so its lovely for him to have his own little space now. 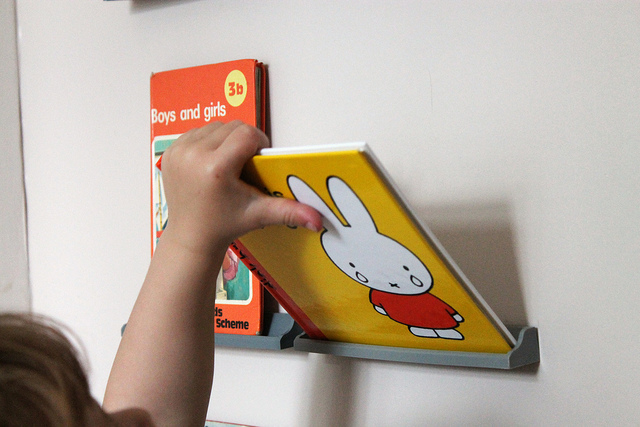 I just have a couple of little bits to do in Elizabeth's room and then that's all finished too! The room looks fab. I love the scrabble idea to hold books. 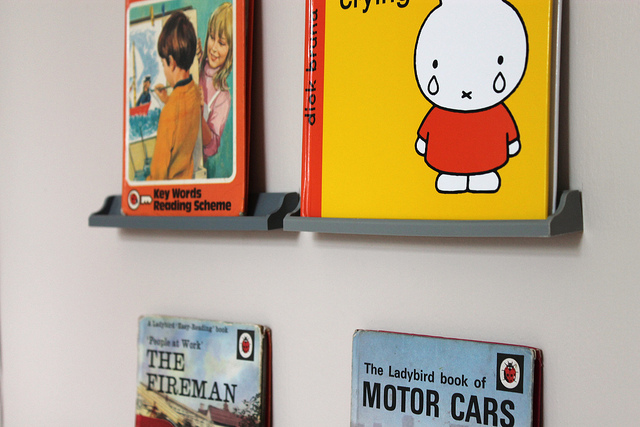 No need for artwork as the books do the job! 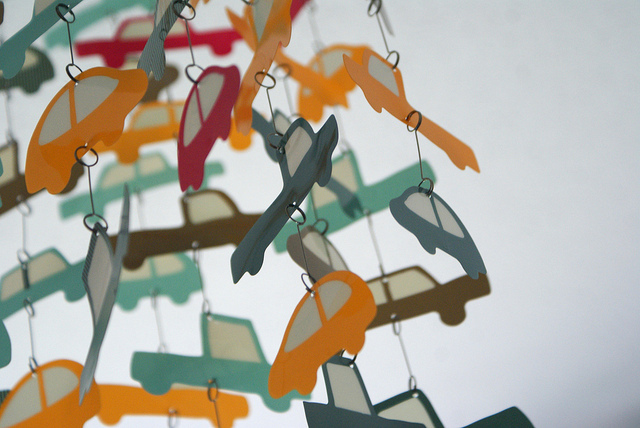 Looks fab, love the car mobile! Blimey - that is gorgeous and fabulous and 'oh my' I want a room like that...all forty years of me. Oh that is just amazing! I love all of it. I have a 2 year old boy who would be beside himself with joy if he had such a funky bedroom. Love it all! The cube shelves are great and the scrabble shelves are inspiring. Really fab mix of old and new. Big sisters rooms are very popular in this house too!! 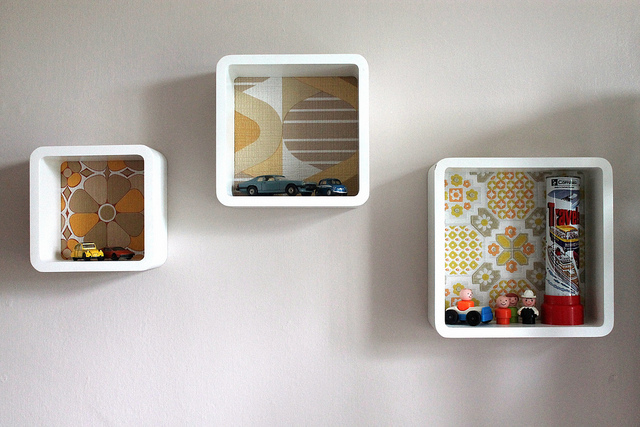 Especially love your wallpaper inside the wall shelves...when can I move in???? What a great room for a little boy. i love the car mobile so much! Hi there. 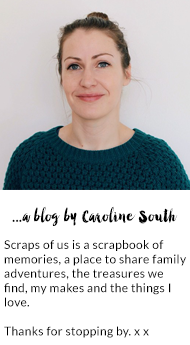 I've just found your lovely blog for the gorgeous Rachel over at Tea With Lucy. Love Archie's room. So sweet. I'm a vintage decorating obsessive! Looking forward to meandering through lots more of your posts.